Beginning RE: Accumulated surplus at the beginning of the financial year. Net Income: Balance amount left for the company after deducting the expenses such as the cost of goods sold, salary expenses, interest, taxes, depreciation & amortization from the Net Sales of the company. Dividend: Amount paid to the shareholders for holding each share of the company, it is paid out at the end of the financial year. 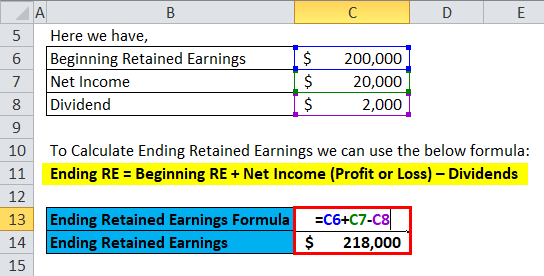 Let’s take an example to understand Retained Earnings Formula in a better manner. Suppose Jargriti Pvt Ltd wants to calculate the Retained earnings for this financial year end. Below is the available information from the Balance sheet and income statement of Jagriti Pvt. 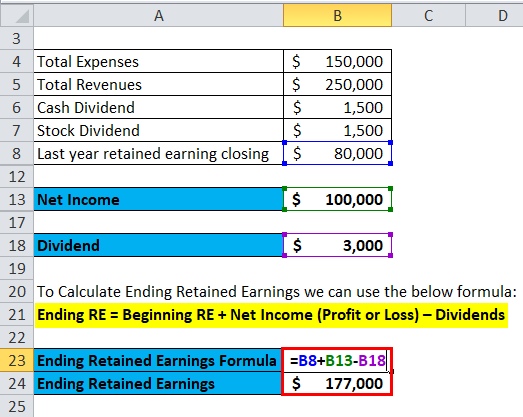 Ltd.
For calculating Retained Earnings we need Net Income and Dividend. Dividend can be calculated by adding Cash Dividend and Stock Dividend. Jargriti Pvt ltd Retained Earnings for this financial year is $ 1,77,000. Let’s assume Anand Group of Companies have shown following details as per its financials for the year ended 2017-18. Beginning Retained Earnings of the company is $ 200,000, the company has reported net income of $20,000. And the company is planning to issue dividends to the shareholders of $2000. Now we need to calculate the Ending Retained Earnings for Anand Group of companies for this financial year. Ending Retained Earnings for Anand Group of companies for this financial year is $ 2,18,000. Let’s assume Anand Pvt. Ltd. has beginning retained earnings of $30,000 for this accounting year and the company has shown Net Loss of $40,000 in its income statement. Anand Pvt Ltd will not be paying a dividend for this financial year. We need to calculate the retained earnings for Anand Pvt. Ltd for the year-end. Anand Pvt. Ltd. has a deficit of $10,000 at its business. 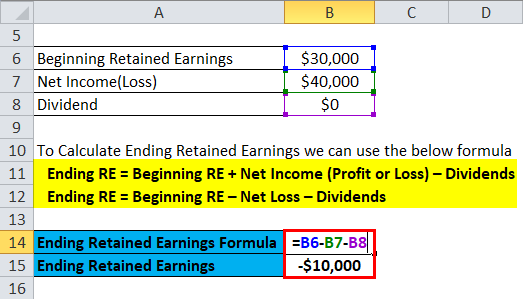 As retained earnings are calculated on a cumulative basis, they have to use -$10,000 as the beginning retained earnings for the next accounting year. Anand Pvt. Ltd has to need to generate high net income to cover up the cumulative deficits. 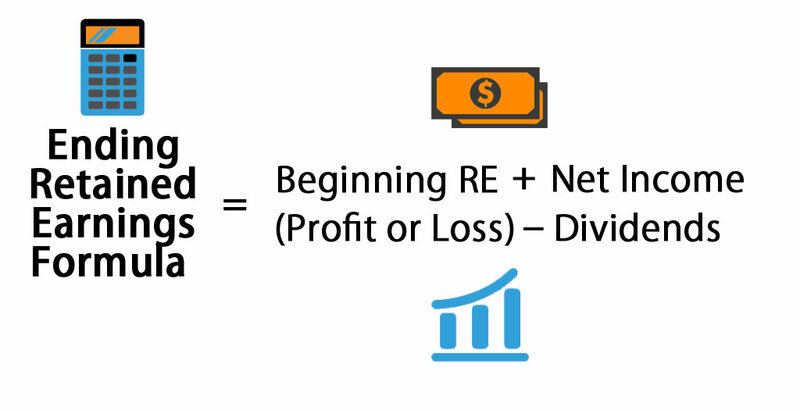 The Retained earnings formula basically depends on two factors Net Income and Dividend. Net Income is the balance amount left for the company after deducting the expenses such as the cost of goods sold, salary expenses, interest, taxes, depreciation & amortization from the Net Sales of the company. The dividend can be in the form of Cash Dividend or Stock Dividend. Total Dividend can be calculated by adding Cash Dividend and Stock Dividend. Retained earnings figures during a specific quarter or year cannot give meaningful insight. It can only be analyzed when it is taken over a period of time, e.g. 5 years trends showing the money company is retaining over the years. Investors would be more interested in knowing how much retained earnings company have generated and are it better than any other alternative investments. Retained earnings show how the company has utilized its profit over a period of time which the company has reinvested in its business since its inception. Reinvestment may be in the form of purchase of assets or payment of any liability. However, it does not show the cash available after the payment of dividends. It also shows the dividend policy of the company, as it shows whether the company reinvest profits or have paid a dividend to its shareholders. Retained earnings are mainly analyzed for evaluating the profits and focusing on generating the highest return for the shareholders. The requirement of the retained earnings depends on the industry in which the company is working. Companies in Capital-intensive industries or any growing industries lean towards maintaining higher retained earnings than other industries mainly due to their requirement of more asset for its operations and retained earnings can be utilized for investment in assets. The companies which have started their operations many years ago also reports higher retained earnings as a comparison to new ones. These issues can make the comparison of retained earnings more difficult. However, we can take companies with the same age and of the same industry to make the proper comparison. We can analyze a company for its dividend pay-outs or long-term investments by analyzing its retained earnings. 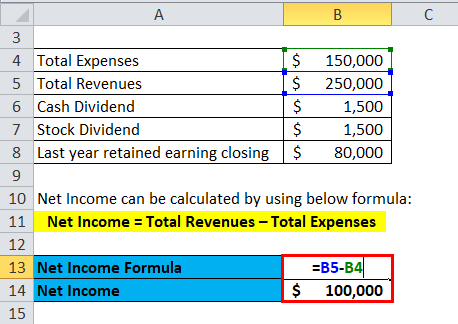 How to Calculate Return On Average Equity Formula?